Still love those "Jersey Boys"
I couldn't have been more excited to see "Jersey Boys" for the second time this weekend at the State Theatre. Friday evening's audience especially enjoyed "Can't Take My Eyes Off You," performed by Joseph Leo Bwarie as Frankie Valli. After he finished, the crowd gave him a semi-standing ovation. I've never seen a mid-performance reaction quite like that. Bwarie himself looked somewhat taken aback by the reaction, but allowed the crowd to applaud before continuing the performance. My favorite parts of the show include the Four Seasons' TV appearances, which are filmed and projected on a big screen behind them - how neat! I also love the group's big stage performance: The clever use of bright lights puts the audience on stage with the Four Seasons, seeing exactly what they would have seen. My less favorite parts of the show: the giant graphic images projected on screens on the set. Several times in the show, the backdrop is transformed into a New Jersey skyline with changing colors in the sky, which I really like. But several more times in the show, giant graphic images that are generally related to what's happening in the show are projected on screens in front of that. They're a little cheesy. Jonathan Hadley, as producer/writer Bob Crewe, was one of my favorite performances in the show. And can anyone confirm for me if the actors playing Tommy DeVito and Nick Massi were actually playing their guitars? Being able to act, sing, dance and play an instrument night after night in a successful touring show also would rank up there in my favorite things about "Jersey Boys." The show is not intended for all ages. A sign posted in the lobby even warns the audience of bright lights, loud noises and "authentic profane Jersey vocabulary." But those who enjoy the Four Seasons are probably old enough to handle the mature situations in the show. If you like the ensemble's music, you're probably going to love the show, and you should do yourself a favor and get tickets before the show's run in Cleveland ends July 17. Click here to read Mark Meszoros' preview of "Jersey Boys," and what it takes to play Frankie Valli. Check back to News-Herald.com/Life later this week for Bob Abelman's review of the show. Click here for information on the Cleveland portion of the "Jersey Boys" tour, or here for more information on the touring company. The latest Pixar film easily topped the weekend box office, more than doubling the No. 2 finisher. I'm not surprised because, as I've said before, kid-friendly movies tend to do well at the box office (except for "Judy Moody", who seemingly had her last opportunity for a top-10 spot last week). 10. “Midnight in Paris,” $4.5 million. "The Muppets" is slated to hit theaters Nov. 23. With the help of three fans, the Muppets must reunite in order to save their old studio from a greedy oil tycoon. I was watching Rambo: First Blood Part II on AMC Tuesday night and the cable network added interesting and entertaining show notes throughout the film. One of the first to pop up on screen is the fact the word "Rambo" is now officially a word in the dictionary. Wait, what? Yes, believe it. Ram-bo (ram-boh) - noun. A fanatically militant or violently aggressive person. Vaughn (as in Rick, from Major League) - Incarceration or lack of control. Lang (as in Clubber, from Rocky III) - Pity or pain. Gekko (as in Gordon, from Wall Street) - Unrestrained greed. McClane (as in John, from Die Hard) - Foul-mouthed, wise-cracking or no-nonsense cop. Balboa (as in Rocky, from Rocky) - A Stallion of Italian descent. Creed (as in Apollo, from Rocky) - A master of disaster or king of sting. LaRusso (as in Daniel, from The Karate Kid) - To wax on or wax off. Vader (as in Darth, from Star Wars) - Dark or father. Jones (as in Indiana, from Raiders of the Lost Ark) - Obtainer of rare antiquities. Callahan (as in Harry, from Dirty Harry) - Obeyer of higher moral authority. Riggs (as in Martin, from Lethal Weapon) - Loose cannon. Don (as in Corleone, from The Godfather) - The act of not refusing. I love me some Aziz Ansari, so I was pretty thrilled when I found out he was performing at Lakewood Civic Auditorium for his Dangerously Delicious tour. The BF and I ended up with fourth row seats - perfect for a comedy show, where you are close to the stage but just far enough that the performer won't heckle you. The show was Wednesday, and it absolutely lived up to my expectations. Max Silvestri opened the show. I don't remember much from his performance, but he was a good warm-up for the comedy that was to come. Ansari took the stage without much fanfare, walking out without introduction. The first thing he said was there is no videography or photography allowed at his show, explaining that flashes leave spots in his eyes, causing him to lose his concentration. But, understanding that his mostly young audience needs to publish their lives on Twitter and Facebook, he said we could all get out our cameras and take a few photos of him. So this photo is not so much him doing his performance and more of him talking about how we can tell all of our friends about the great jokes he was telling at this time. He did an hour of great comedy - all jokes I had never heard before. My face hurt from laughing so hard, and even while seated, my boyfriend was doubled over laughing at several times throughout the show. Nearly a week later, we're still quoting some of his jokes - and still laughing. After his hour, Ansari left the stage for a few minutes. When he returned, he said the first hour we heard was for his special that was filmed Friday in Washington. With his polished act finished, Ansari got a little more casual, asking the audience what we wanted to talk about. Several people shouted suggestions, like Harris and Kanye, and Ansari had material for that and more. I haven't been to many comedy shows, but I loved that Ansari gave the audience a tight, well-rehearsed set, then got a little more casual to give us a few more laughs. The way he interacted with the audience made me feel more like we were in a small club, rather than a large auditorium. I definitely want to see him perform again, and I look forward to catching his special on TV. I blogged last month about TomHaverfoods.com, an Internet meme based on Ansari's "Parks and Recreation" character, Tom Haverford, and his nicknames for food. Click here for a NSFW (language) video of Ansari doing stand up. 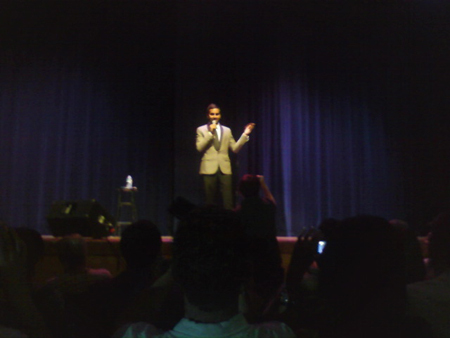 Get more from Ansari himself, on his website azizisbored.tumblr.com, and his Twitter feed @azizansari. Less-than-stellar reviews didn't keep "Green Lantern" from a $52.7 million debut this weekend. And Judy Moody seems to be having quite a bummer summer: After opening at No. 7, she's already down to No. 10. After "Cars" opens next weekend, she is sure to lose her spot in the top 10 after two weeks. Let's face it: Google is the world's most popular search engine. "Googling" has become synonymous with "searching," when it comes to finding something on the Internet. For those of you more serious Googlers, you probably know that the multi-bajillion dollar company also makes it a priority to give employees a chance to be creative and explore their field in the hopes that allowing innovation will lead to "the next big thing." The culture of innovation has kept Google at the forefront of technology, and allowed the company to create and explore many advances not necessarily restricted to Internet searches. One creative thing in particular Google is known for is it's doodles. For dates of note, such as celebrity birthdays, holidays or anniversaries of historical events, Google replaces it's logo on www.google.com with an image manipulating the common logo with something related to the significant date. Google even hosts regular competitions for children to design doodles. The most fascinating recent doodle was one celebrating Les Paul's 96th birthday. On Thursday, Google posted a doodle of a guitar to celebrate the famed musician and guitar-maker. Not only was the guitar cool to look at, it was playable. By scrolling your cursor over the strings of the guitar, you were able to play songs--and even record them and send them to friends. The doodle gained so much popularity that Google decided to put it up for another day (most doodles only last 24 hours). Because it was so popular, Google has given it a permanent home here. Definitely check it out and play with it. It's a fun diversion, even if you don't consider yourself to be particularly musically inclined. Also popular, celebrities (and regular folk like us) have been making videos of their recordings and posting them on YouTube. Here are some examples. If you want more, I suggest searching on YouTube. There are many to choose from, some better than others. It's pretty neat to hear how well people have been able to master a little Internet "game" so quickly. What might surprise me most about this weekend's blockbuster numbers is that "Fast Five" is still in the top 10. Didn't anyone see The Onion's interview with the screenwriter? For a 5-year-old, that kid apparently makes pretty good movies. I'm somewhat surprised that "Judy Moody" opened so low. Usually family-friendly movies are big box office draws -- but maybe not as much without the names "Pixar" or "Disney" behind them. 8. “Midnight in Paris,” $6.1 million. I'm interested in obsessed with Bravo and will watch anything the cable network produces. This summer the network debuted two new shows: "Million Dollar Decorators" and "Platinum Hit." I thought for sure I would love "Million Dollar Decorators" because of my previous love affair with "Trading Spaces" (confession: Ten years ago my goal in life was to be Paige Davis). But "Million Dollar Decorators" is not exactly the redecorating show you would find on HGTV. In January, I blogged that another Bravo show, "Million Dollar Listing," is an HGTV show plus drama, so I should have expected "Million Dollar Decorators" to be the same. I'm much less interested in these decorators and their personal lives than I am in the gorgeous homes they put together. Sure, I'll keep watching it, but it's one that I'll watch while catching up on my Google Reader. "Platinum Hit," on the other hand, had pulled me in after one episode. It's not a singing competition, or based on musical ability, but instead at how good these contestants are at writing songs. And after watching this last week, I now understand just how difficult song-writing can be. Most of the characters on the show are divas - of course, because the entertainment industry is full of them. But some of them are really good musicians - like Nick Nittoli, who basically opened the first episode saying he was the next Michael Jackson. I don't know if I would go that far, but I was pretty impressed with the hook he wrote for the first challenge and the song it turned into. I'd actually like to download it, which Bravo conveniently (and smartly) allows viewers to do here. If you want to tune in and missed any episodes, you can catch up on BravoTV.com - or just turn on Bravo at any time of day. The cable network re-runs every episode of every show almost on a loop. P.S. : If you're a fan of "Modern Family," tune in to "Inside the Actors Studio" at 8 p.m. Wednesday on Bravo. The adult members of the cast paid James Lipton a visit. "X-Men: First Class" opened at No. 1, though The Associated Press notes that the prequel did not take in as much money as the earlier releases in the franchise (when adjusted for inflation). Still, nearly earning $24 million more than your biggest competitor for the weekend is not too shabby. 8. “Midnight in Paris,” $2.9 million. 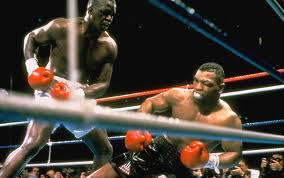 The tale of Columbus boxer James "Buster" Douglas was a quick one. One minute, he shocked the world, knocking out the "Baddest Man on the Planet" Mike Tyson in Tokyo to win the heavyweight belt, the next he was knocked himself by Evander Holyfield months later. It was the end of one of the most improbable sports stories in some time. It all happened in 1990, which means there's a generation of people who don't know the story of Buster Douglas. Thankfully, Hollywood is making sure moviegoers don't forget it. The Columbus Dispatch reported this week "Buster," a movie about Douglas' monumental upset of Tyson, is expected to begin shooting this fall. John Johnson, Douglas' former manager, spearheaded the effort to get Douglas' story to the big screen. The group is close to signing screenwriter Angelo Pizzo, who penned "Hoosiers" and "Rudy" to a contract next week, according to The Dispatch. If you can't wait for the movie, check out the book, "The Last Great Fight" about the Tyson-Douglas fight. It's one of the best sports book I've ever read.